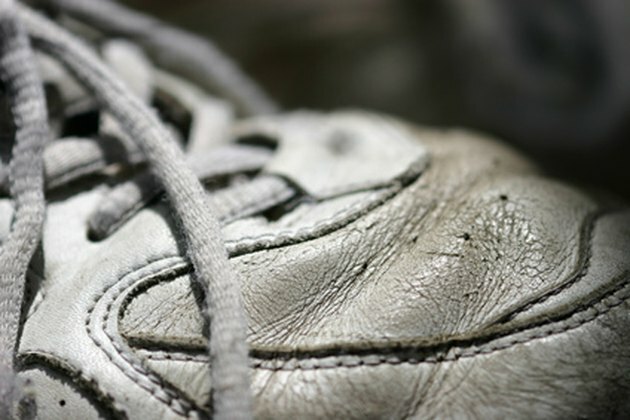 White leather tennis shoes can become dingy and dirty from wear. Leather requires special care and maintenance to prevent damage and stains. This natural material is porous, and it tends to absorb stains. Clean and condition your white leather tennis shoes to restore their appearance and prevent future stains. Although you can wash some leather tennis shoes in the washing machine, hand washing them helps keep their shape. Clean dirty white tennis shoes to restore a bright, fresh appearance. Wipe off any loose debris from the shoes with a dry cloth. Dampen a cloth with water, and wring it out. Wipe off the shoes with the cloth to dampen them and remove light soil. Apply small dabs of toothpaste, not gel, or mild liquid soap onto dirty areas of the shoes. Dip an old toothbrush into water, and lightly scrub the shoes to remove stains and scuff marks. Dampen a cloth with water, and wring it out. Wipe the shoes to remove any toothpaste or soap residue. Dry the shoes with a clean towel. Allow them to air-dry completely. Apply leather protector to a cloth, and wipe it onto the leather shoes. Use a thin layer, and buff it into the shoes.